This is a silly question, but the first Google result speaks of a 'bookmark manager' with an option to import favorites from IE, but I can only find 'organize bookmarks' with an option to import from HTML, and in IE I can't find where to export to HTML. Can anyone help? it will take them from IE for you. Not the answer you're looking for? Browse other questions tagged firefox internet-explorer bookmarks import or ask your own question. Export Firefox bookmarks WITH TAGS? 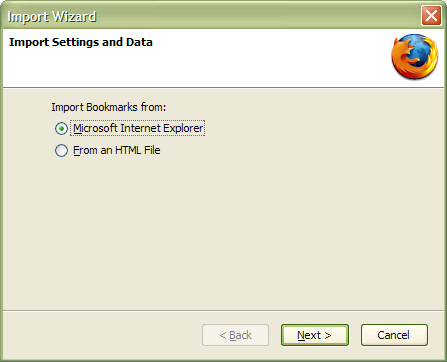 How to Import Bookmarks Well in Firefox?